We’re already well into March and I’m still burning pumpkin scents. No judging! I had so many to choose from over the past several months (and some good ones too!) I just decided to keep going. 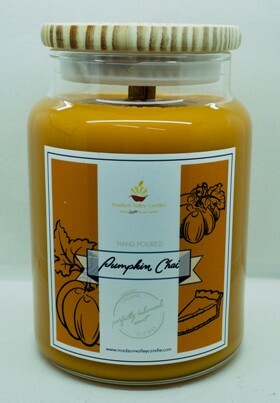 The moment I smelled Pumpkin Chai from Madison Valley – oh yum!! I actually held onto this one and waited to burn it because it smelled so dang good. It wasn’t your average pumpkin scent… the spicy element was strong with this one and it smelled warm and delightful… like a spicy chai tea. Transport yourself to a crisp Autumn day with the swirling spices of pumpkin, cinnamon, nutmeg and a hint of orange peel. While vanilla and graham cracker add a creamy, toasty character. Okay, I know it says “autumn” in the description but trust me when I say this scent is not just for fall. If you love warm and spicy scents with an added bakery kick… Pumpkin Chai is a must have. Honestly, I didn’t smell a whole lot of pumpkin in this scent. What I could smell on cold sniff was the orange peel, cinnamon, vanilla and yes, even the graham cracker – which gave it that bakery element. If the pumpkin was there, it was hidden very well. I decided to stick to a medium size room to burn my Pumpkin Chai candle in and I could easily have moved it to a larger room if I wanted to. Once the wicks were lit, it took minutes before I started noticing the scent. 20 minutes in and the aroma was everywhere, and all I could smell was spice, graham crackers with hints of orange peel and vanilla. Pumpkin? Still nothing on the pumpkin front and trust me, I tried. At times, I even had my nose right around the candle just to see if I could. For me, this scent was all orange, vanilla and graham cracker. Pondering a little more and going back to the name of the scent, this aroma truly did remind me of a chai tea with a shot of cream. It smelled like it. Spicy and warm. The added bakery of graham cracker just made it all the better. 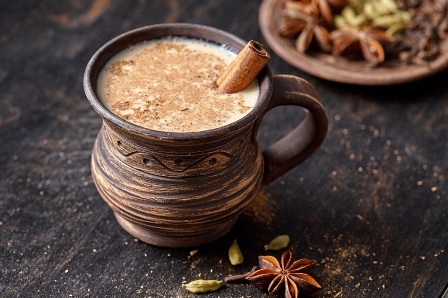 Strength – I would rate Pumpkin Chai a 10 out of 10 in any size room. This candle was a room filler. Super strong! How did my Pumpkin Chai candle burn? This candle burned great, but high maintenance. Meaning… I really had to stay on top of wick trimming or the flames would get way out of hand. I’m serious. Every hour or more, I had to trim both wicks and that lasted till the very end. Some candles just need a little more TLC than others… this was one of them. I liked Pumpkin Chai but do wonder what it would have smelled like with more pumpkin in the mix? Methinks I would have liked it even more. As far as “Chai” scents go, this one was pretty authentic. The orange peel was key and what made it smell so realistic for me. I have some chai tea bags and compared the two… they weren’t exact but pretty darn close.